Air Master Inflator Dial Gauge 16" Hose Haltec I-420 / BOWES HT I-420. Haltec Air Master Dial Gauge comes in a variety of hose lengths and chuck types to meet the varied needs of the tire professional. The inflator is compact with an ergonomic design that makes the gauge comfortable to operate and easy to use. One button allows the operator to inflate or deflate. 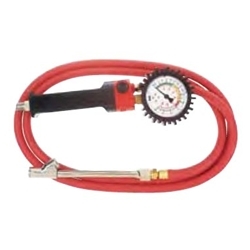 the gauge reads from 4 to 140 psi in 2 pound increments and is also calibrated from 0 to 10 bars in .1 bar increments. The dial gauge is protected with a ribbed rubber shroud.